3 Bedroom Central Pacific Beach Home For Sale in Bejuco Only US$279,000. Great income generator as 66 rental nights already booked for coming season. Beautiful, well maintained pool home located less than 10 minutes from the center of Atenas. This home features 200 m2 (2100 s.f.) of construction, beautifully situated on a 2,000 m2 (1/2) lushly landscaped, view lot. Price reduced to US$360,000. ">Fully Furnished Atenas Home For Sale With Stunning Views Price reduced to US$360,000. This beautiful, large, ranch style home offers some of the most stunning views of the Central Valley and the surrounding countryside, that Atenas has to offer. Price reduced to US$199,000. ">Remodeled Two Bedroom Pool Home For Sale in Atenas, Costa Rica. Price reduced to US$199,000. Newly renovated two bedroom pool home located in Los Angeles de Atenas, just 5 minute drive from downtown. Price reduced to US$210,000. ">Cute 2 Bedroom, 2 Bath Atenas Home For Sale. Price reduced to US$210,000. This home offers 140 m2 (1500 s.f.) of construction on a 1,500m2 (1/3 acre) lot, with an open living room and kitchen concept, high, vaulted wood beam ceilings, large picture windows, hardwood kitchen cabinets, nice tile countertops and backsplash. Price reduced to US$309,000. Good value in a ‘real’ Costa Rican Setting. ">241m2 Home For Sale in Atenas Price reduced to US$309,000. Good value in a ‘real’ Costa Rican Setting. This beautiful new home offers 241m2 (2,594 s.f.) of quality construction, situated on a 490 m2 (.25 acre) lot. Price reduced to US$325,000. ">Beautiful New 2,300 SF Home For Sale In Exclusive Gated Community in Atenas Price reduced to US$325,000. This is a beautiful new home for sale located in a small gated community just 5 minutes from downtown Atenas. Brand New Home For Sale 15 Minutes From Downtown Atenas US$339,000. This nice, pre-construction home offers 288.5 m2 (3,105 sq ft) of high quality construction, situated on a 690 m2 (.33 acre) lot. The main home features 4 large bedrooms, 2.5 bathrooms, spacious, open living areas with a fireplace and 2 story wood beamed ceilings that is punctuated with an enormous handcrafted wrought iron chandelier. Spacious New Atenas Home For Sale With Stunning Valley Views and Swimming Pool US$495,000. Home For Sale By Owner in Miramar, Puntarenas in Costa Rica US$250,000. With seller financing to qualified buyers with 20% down. In a 24 hours gated community, this three bedrooms, two bathrooms Costa Rica bungalow is seat in a 5,000 square meter lot. Located a short 5 minute walk to the white pristine sands of Playa Blanca and situated in the charming beach community of Playa Junquillal which has “La Bandera Azul”, the ecological blue flag award for being one of the cleanest beach communities on the coast line. Playa Junquillal Beach Home For Sale For Only US$229,000. ‘Casa Linda’ is a unique titled property just steps from a Blue Flag beach. Casa Linda is a unique Titled Oceanside property that boasts 3 bedroom 2.5 baths and 1,577 square feet of well-constructed, very spacious living space. Luxury 3 Bedroom Golf Course Home For Sale In Reserva Conchal US$999,000 – Nets $45,000 per year. Welcome home! 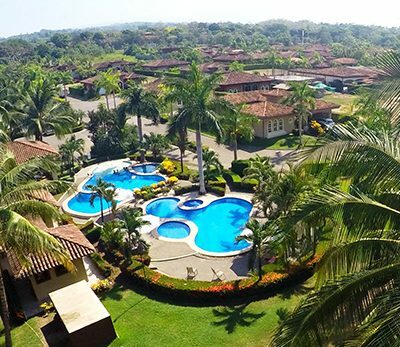 This beautiful 3 bedroom, 3 bath luxury home is located in the exclusive Reserva Conchal Golf & Beach Resort located under one hour from the Liberia International Airport and only 20 minutes from Tamarindo and 5 minutes from Flamingo Beach. With so much to love about Lake Arenal, don’t let your budget stop you from getting the perfect home and living the good life in Costa Rica. Whether “home” means a cozy cottage or a grand mansion, we have a wide range of properties to choose from.